Last week, I took a break from social media and used the time for more productive pursuits. 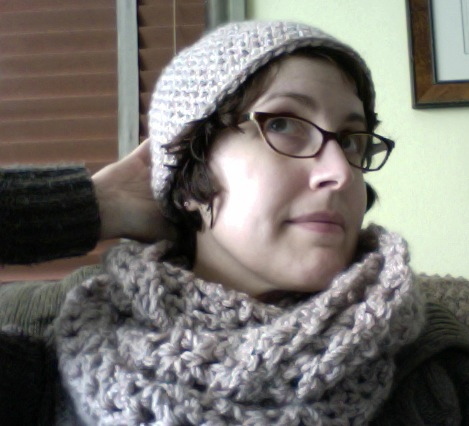 For example, Exhibit A above, my first crocheted hat. 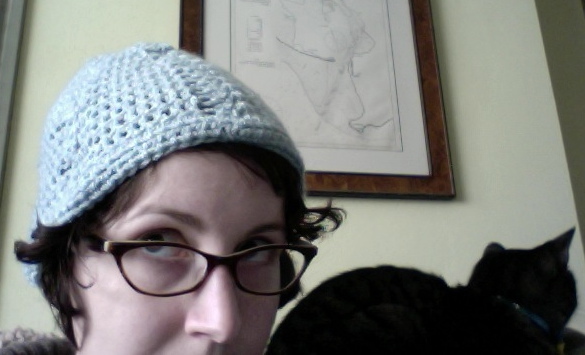 (That’s Sugar next to me, expressing her usual enthusiasm.) It was so easy, I moved on to Exhibits B and C.
1. I got a picture book manuscript ready, which is going out on submission THIS WEEK. Fingers crossed. 3. I restructured the plot of a novel I set aside a while ago. Looking forward to diving back in. 4. I cleaned my office. That last one, the office-cleaning, was a big step for me, as I haven’t fully re-inhabited that space since I shut down my freelance editing business, Bluebird Works, this past fall. And I’d never really completed sorting and filing a lot of paperwork and other stuff from before that, when I went through chemo. I’d been avoiding it all by just shutting my office door and ignoring it, and doing most of my work while sitting downstairs on the living room couch with my laptop and feline assistants. But just because you avoid and ignore something doesn’t mean it can’t creep up on you, and that secret upstairs mess had been plaguing me for too long. It was tremendously satisfying to give myself the time to clean and organize everything and SHRED all the stuff I no longer need; finally, I have a space in my house that accommodates my new life as a full-time writer. Photos to come! Do you have a special work space in your house? When was the last time you cleaned it? My desk is in need of a good cleaning – only the top of the desk and its top drawer, though, since the file drawer and the middle one (that holds tablets (of paper) and such) are in good order. It will be a relief to get it done, but what really needs tackling is the file cabinet in the basement. Must. File. Things. Glad you enjoyed your time away, but it’s nice to see you back. I hear you re: the pack-ratting, Peter. But I’ve learned to value clean, open, organized spaces over any future value those objects might hold. So I have learned to be MERCILESS. I find it very satisfying now to fill up garbage bags, recycling bins, and donation boxes!